Many pregnant women worry whether their normal, pre-pregnancy exercise routine is still safe once they are expecting a baby. You may be worried about riding a bike, doing aerobics, or anything that puts pressure on your abdomen. Most forms of exercise are safe during pregnancy, but expectant mothers should obviously stay away from bungee jumping or other extreme sports. On the other hand, can you still have a healthy pregnancy without working out? Physical exercise is an essential part of any person's overall health. People who don't move a lot can face any number of health problems, and pregnancy is not an exception unless you are specifically on pregnancy best rest for medical reasons. Every pregnant woman should aim to be physically active, and remaining stationary to protect your baby from harm is counterproductive in the majority of cases. Having said that, it is possible to have a healthy pregnancy without "working out". You can be an extremely fit and active pregnant woman without ever setting foot in a gym or joining a prenatal swimming class. "Working out" and physical activity are not, after all, synonyms. Do you walk or cycle to work? Do you walk around the mall to shop for your baby? You've probably covered miles that way! Perhaps you enjoy gardening, or get moving while you clean your house or run after young children, or have a job that involves a lot of moving. The idea is to make sure that you are not a "couch potato". 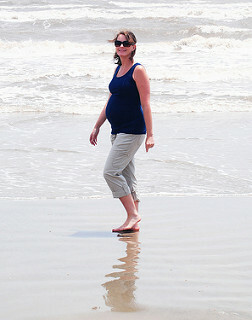 Many women enjoy prenatal exercise classes, but you can certainly be physically fit without a specific work out routine. Women who are physically fit and have well-toned muscles are likely to feel better during pregnancy, and may also have an easier birth and postpartum recovery. But, there are many different ways to get in that physical activity! Treadmill Vs Running Outdooors: What Is Better? balanced body with pilates-how long until I reach the goal? What are causes and risk factors for postpartum depression? Is pilates ok during pregnancy? what do you think about winsor pilates? Postpartum hair loss - why and how?